Godspeed's fronted by a 3rd-generation San Diegan who used Bush the Younger's enhanced '08 refund to leave her job at MotorCult, take an advanced leather-working class, and start up a business tooling, burning, and tattooing cow-hide with gearhead-influenced art, just like Pi-car-so. 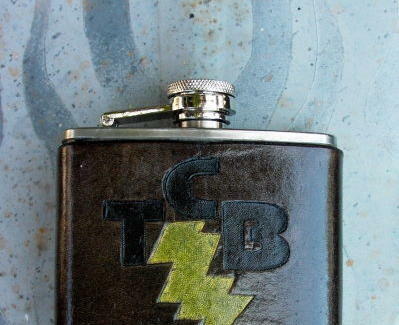 The most useful items are intended to make you largely useless: leather-bound stainless-steel flasks emblazoned with scenes like a revolver wielding pinup cowgirl ("Huckleberry", as in "I'll be your..."), the if-Elvis-drank ode "Taking Care of Boozin'" with a block-lettered "TCB" sprouting a lightning bolt, and a design featuring the all-seeing Eye of Providence, so even if you can't remember what happened last night, your flask will. 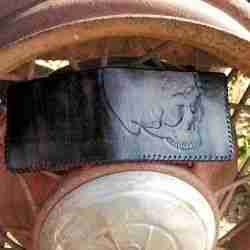 Money clips, wallets, and belt buckles are also available bearing all manner of imagery: a mustachioed skull flanked by aces, an old-timey keyhole view of some old-timey stockinged legs (what up, Erin Andrews' grandmother), hinges from an ancient trunk, and a severed blue clawing hand with a wailing mouth on its palm (somebody's feeling pre-henstrual). Any piece from the portfolio can be custom ordered regardless of current availability, and completely personalized items can be commissioned via e-mail, with customer preferences ranging from a Dia de los Muertos-ized motorcycle seat to a shamrock'd belt reading "Irish Prick" -- a lot of bragging if your cylinder's not Zonian.